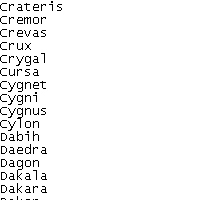 Yet another randomiser for GalCiv2. This one can be used with ALL English versions of the game! Supported are GalCiv2: Dread Lords, Dark Avatar and Twilight! If someone sends me a list of all available language versions, the next release will cover those as well. .NET 2.0 required, XP and upwards should already have that. Place in you game folder (e.g. GalCiv2\DarkAvatar) and run.